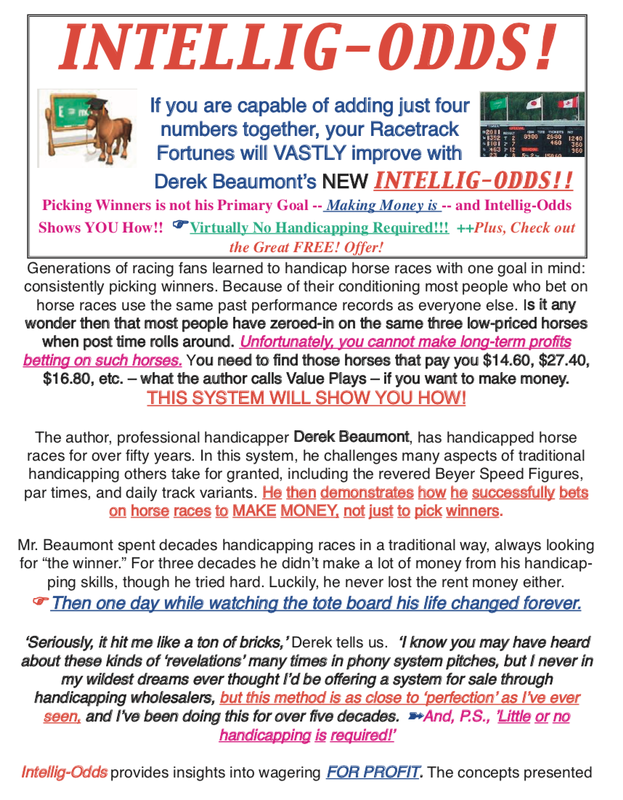 Editor’s Note: I first met Derek Beaumont at a handicapping tournament at the Del Mar. He had the seat right next to mine and we engaged in some light conversation while digging into the Racing Form looking for plays for the upcoming race at Arlington. 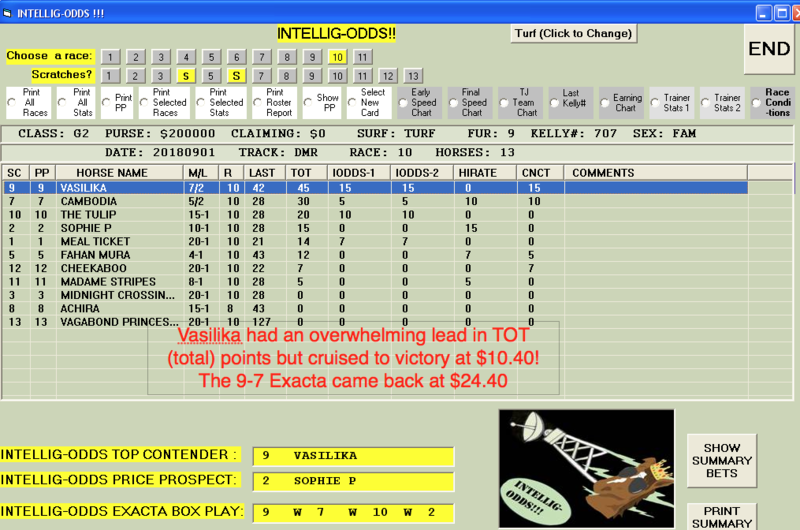 Well, at least I was digging into the Racing Form. While Derek would glance down at the pps on occasion, I noticed that most of his concentration was on the toteboard. He would write down several figures for different horses and appeared to add them up, while circling them with different colored ink pens. 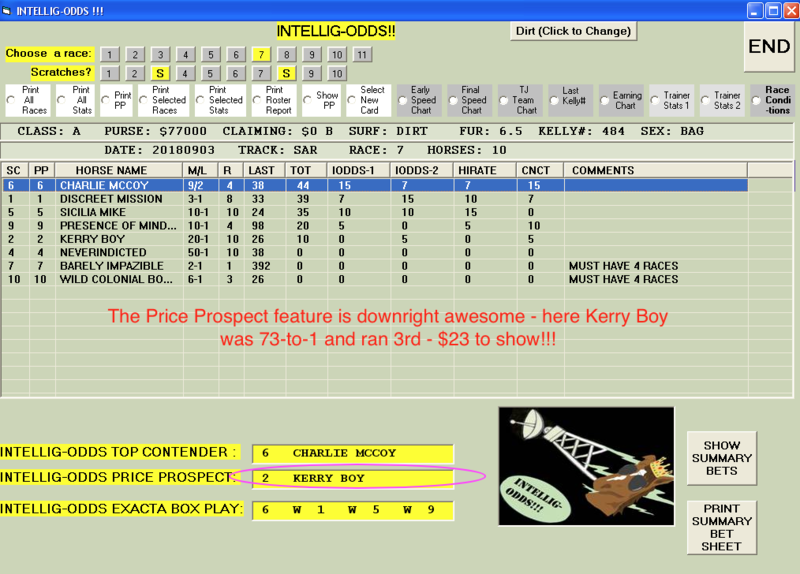 I didn’t think much about it at first, but after he hit a $23.20 and $16.80 in two of the next three races, and was now in 3rd place out of the 75 players in the contest, I became curious. 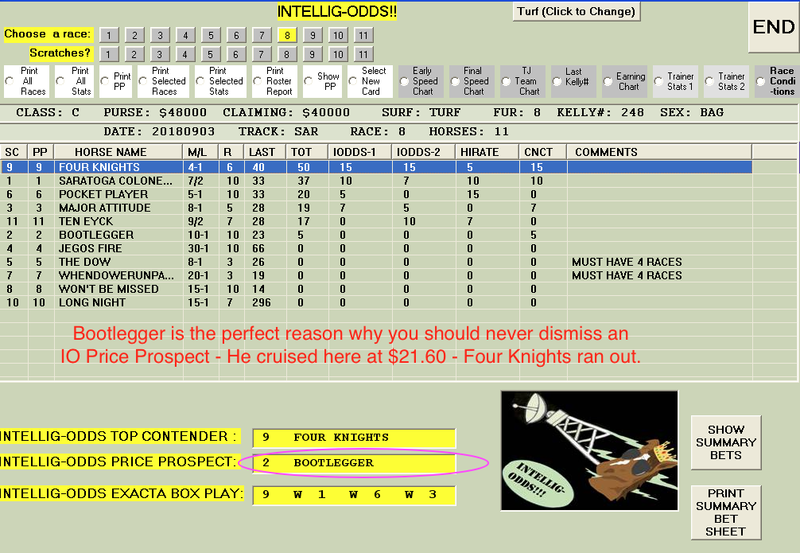 After congratulating him on the $16.80 hit, I asked him how he found the horse, who looked outclassed to me. I pretty much left it at that (he did end up with 3rd money of $7,500 at the tournament – I finished 34th), but I told him that I worked for RPM, which he had heard of, and that we were always looking for quality methods to offer to our clientele if he were ever interested. We exchanged phone numbers and went our separate ways. Well just last month, two years after our meeting, he called to say he may be interested in marketing his method. He said he had refined the method further and it was working better than ever. 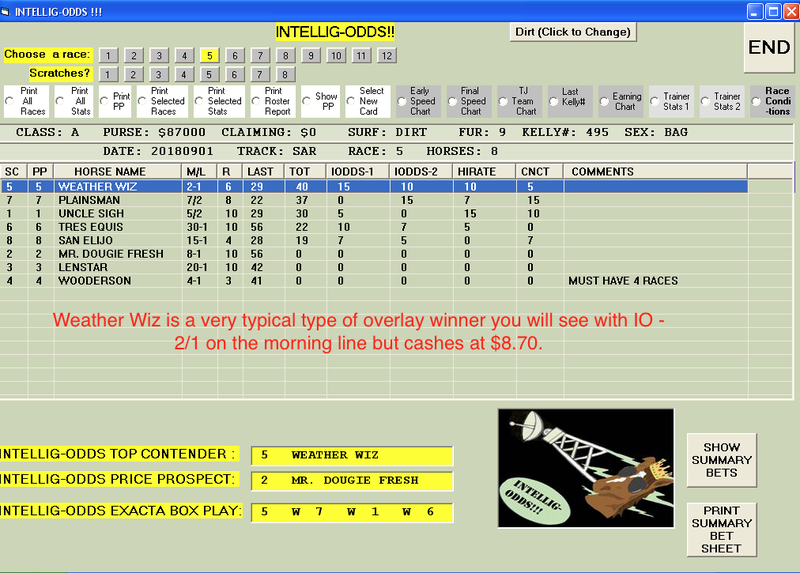 His main concern was that if he sold his system, it may reduce the prices on his selections. I assured him that I had honestly never seen that happen, but he still wanted a limit on the number of sales if we decided to carry his method. 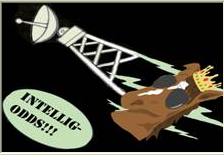 »⇒And after testing the method, everybody at the office agreed that it was a dilly — not only extremely simple to use, but very effective in picking good priced winners on a steady basis. Very little handicapping is required. How to Flip the Odds in Your Favor! 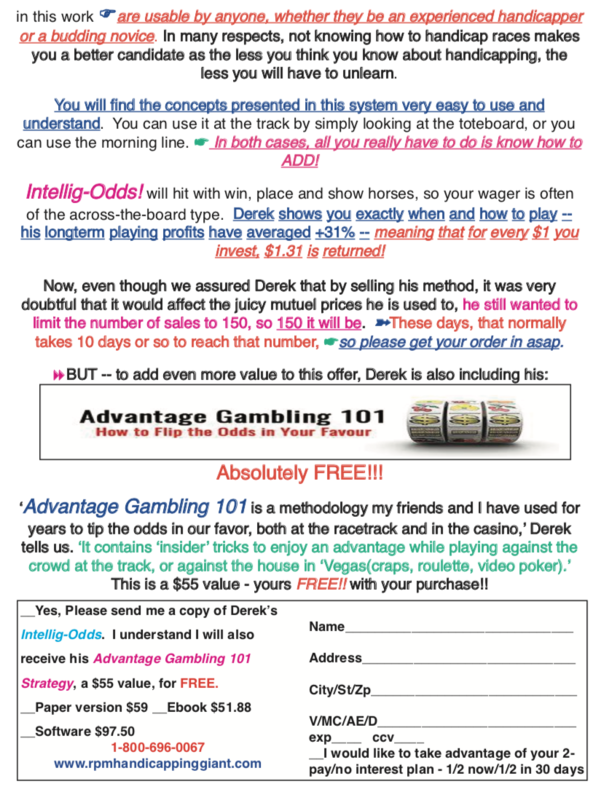 ✈︎✈︎Derek is not only a horseplayer, but seriously plays craps, roulette, sports, etc. He and a partner have developed methods that insiders use to get an edge on not only horseracing, but also on casino games, including my favorite, Video Poker. This is good stuff – it can provide you with and edge that only a tiny percentage of all gamblers are aware of!! and even better, it’s FREE!! — a $55 retail value — FREE!!! Anyway – read up on Intellig-Odds — you are definitely going to want a copy for YOUR very own! 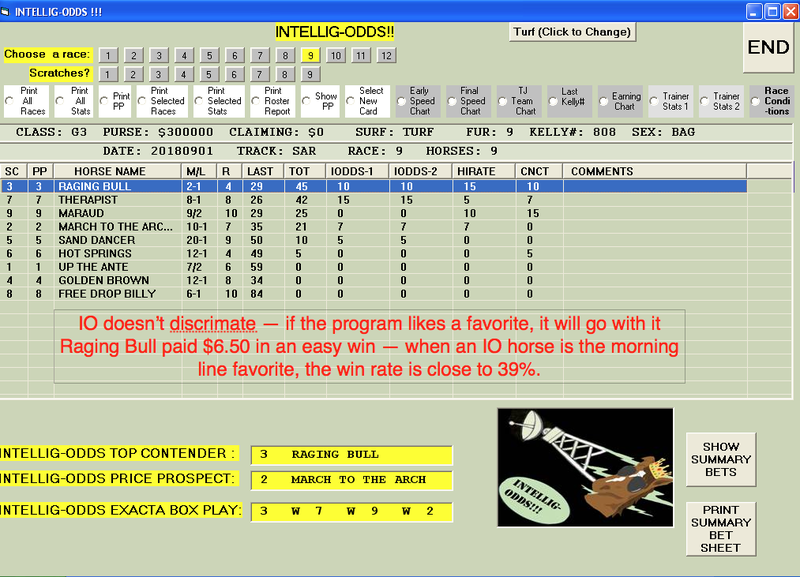 The Intellig-Odds Software not only saves you time, since selections are generated instantly, but provides several other features that will make your I-ODDS experience Pleasurable and Profitable. Take a look at some of the screenshots below. Call us with any questions. And, again, we guarantee that you are really going to like this one!